Episode #51 - Holiday Giveaway Show! It's our first ever holiday giveaway show! Congratulations to all the winners! On this new show we giveaway some really cool cruise swag from our sponsors! Scott and I want to thank them for their generosity to share with our listeners! If you heard your name mentioned as a winner, expect a email soon requesting your shipping address. Please take time to click on their links below to learn more about their cruise line and the wonderful cruise options for you and your family. You will find helpful people that will craft a memorable cruise vacation experience of a lifetime! This was also the first time we Periscope our first podcast segment! We had a lot of crazy fun - you can also watch it here: The Cruise Dudes Holiday Giveaway Show! Also on this show, we share cruise news, cruise chit chat, shout outs, theme cruise of the week and so much more! Please share us with your family and friends - it really helps to expand and grow our show through word of mouth and the various social media outlets we use. We appreciate our listeners and their support of our show - you are the best! We are quite amazed that we have produce 50 podcast shows in less than two years! It has been an exciting adventure and we are just getting started! SPECIAL ANNOUNCEMENT! Save the date - December 20th! We are having The Cruise Dudes Holiday Giveaway Show! We are giving away gifts from MSC Cruises, Princess Cruises, Carnival Cruises and other surprises! This show will be broadcast live via our Periscope account 10:00 a.m. P.S.T. To enter, please fill out the contest order form on the left side of this page. No purchase is necessary. U.S. residents only. On this new podcast episode we welcome the Cruise Sisters from Germany! Juliet and Janice are cruise travel bloggers and who have a lot of experience cruising the European, Mediterranean and African ports. On top of that they love to share on their social media accounts and website beautiful photos and valuable travel information. On today's show they share with us some of their amazing adventures, experiences, travel tips, and the differences between a American cruise and a European cruise ship vacation holiday. Please take the time to visit and follow them! The Cruise Sisters will be taking a Christmas cruise with TUI Cruises Mein Schiff 4 to the Canary Islands and will be interviewing with the ship's cruise director, so be sure to follow their adventures via social media. 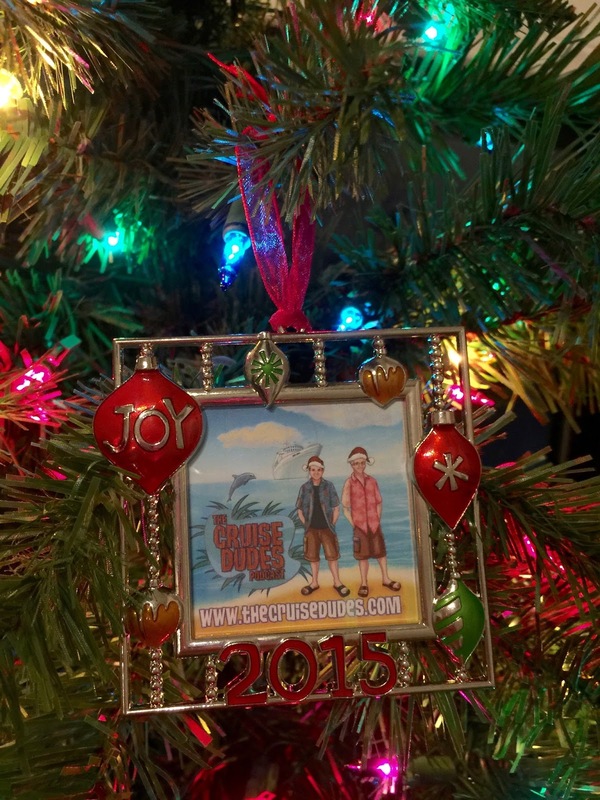 The Cruise Dudes 2015 Holiday Ornament! Get your original limited edition holiday ornament! $10.00 plus $3.00 for shipping. U.S. residents only. Shipping to foreign countries, quoted and calculated later. Email thecruisedudes@gmail.com for your order. It's a brand new show for your listening pleasure! On this show we welcome back Matt Hochberg of Royal Caribbean Blog to tell us all about the Anthem of the Seas. This is RCCL's latest Quantum Class ship and it is now home porting from Cape Liberty in New Jersey. Matt was able to take a preview cruise a few weeks ago, so we asked him to come on the show and share with all of us his experiences on this beautiful vessel. It is always a fun time to have Matt on the show, be sure to check out his blog and connect with him. He is active Periscoper, aboard the ships and on land, and has lively conversations about cruising. SPECIAL ANNOUNCEMENT! - We are having a special online event coming for the holidays and you can be first to know all about it! Sign up for the special email announcement that will be made early December! We can’t wait to tell you all about it! Hermosa Hotel, Catalina Island: This super deal starts on November 3rd through February 29, 2016 for midweek travelers, arriving from Sunday through Wednesday only. For only $249.00 you will two nights at the hotel plus a round trip on Catalina Express for two people. Visit their website, and write in "The Cruise Dudes" in the "Voucher" box and the price will be honored. Click Here >>> Hermosa Hotel Reservations! And don't forget to say "Hi!" to Mark for us! We hope that you and your family have a great Thanksgiving holiday this week. Please share us with your family and friends - it really helps to expand and grow our show through word of mouth and the various social media outlets we use. We appreciate our listeners and their support of our show - you are the best! We are back and the holiday season is upon us. Can you believe that 2015 is almost over and 2016 is right around the corner? Incredible! On this new show, Scott and I discuss the family entertainment options and experiences on Carnival and Royal Caribbean cruise lines, specifically, the licensed characters from Dr. Seuss and DreamWorks and how they incorporate the characters along with children's activities, unique spaces on the ship, with parades, shows, movies, photo opportunities, dining experiences and more. Carnival and Royal Caribbean are moving forward and are aggressively promoting these special interactive opportunities with these well known children's characters on board their ships. We expect to see in future advertising and marketing materials these licensed characters being used to draw potential cruise decisions. And why not? On a cruise ship, you will have a much more intimate and quality experience than in a theme park. Undoubtedly, these experiences have huge potential for the cruise lines and we expect them to make further investments into these licensed characters with the addition of unique spaces and more on board ships in the coming years ahead. Also on this show we have cruise news, cruise chit chat, and our theme cruise of the week! It's an action packed show of cruising goodness, we hope you will enjoy it! Feel free to contact us and ask any questions, we will answer them on a future show. We appreciate our listeners and their support of our show - you are the best! Also visit The Cruise Dudes Amazon Associates Store for your cruise gifts! It's a double bonus show! On this new show we interview Amanda Hathorn-Geary from Get A Life At Sea and Don Bucolo from Eat, Sleep Cruise. First up, Amanda worked on cruise ships for 10 years, she shares her experience and stories what it is like to work on these ships while traveling all over the world. She also tells us how she earned 4 degrees while working on board as well. Amanda now helps prospective clients find their perfect job on a cruise ship. We are sure are going to enjoy this informative and insightful interview as much as we have. Our next interview is no stranger to our listeners. Don just got home from a Southern Caribbean cruise on the Royal Caribbean's Adventurer of the Seas with his wife, plus his sister-in-law and mother-in-law who were first time cruisers. And they had an exciting adventure indeed: their ship had to navigate around Tropical Storm Erica, so their itinerary changed on this cruise, and they had to make some quick decisions what to do at these unplanned ports stops. Don tells us all about what they did and how they still had a great time despite what happen. Blog Post: "How I earned 4 degrees in 6 years working onboard cruise ships"
Scott is back from another four day cruise to Catalina and Ensenada, Mexico on the Carnival Imagination. This cruise was with his mother, (her first cruise ever) and she was celebrating with her former high school friends a class reunion cruise. Scott shares his experiences with these seniors and what to expect when you cruise and travel with someone who has mobility issues. There is a lot of good information, insight, and fun on this show. Check back later for photos and a review from Scott. Also on this new show, we have cruise news, cruise chit chat, theme cruise of the week, listener email, and our opinions, of course. We appreciate your support of our show. Thank you so much for taking the time to listen and share it with your family and friends! Episode #45 - Birthday Celebrations on Catalina Island and Helga! Happy Birthday to us! It was our birthdays last weekend (Tommy, September 27th and Scott the 28th) and so we keep the party going on this podcast. On this show Scott tells us about his birthday trip to Catalina Island and all the great discounts and freebies you can get when you visit on your birthday! Many locals visit Catalina for quick getaway from traffic and headaches of Los Angeles life to this island paradise 26 miles from California coastline. Catalina is also a favorite cruise stop for Carnival and Princess cruise ships too! Please check out Scott's review with links, video and great information down below. Also on this episode we have news about the impact on various cruise lines from hurricane Joaquin, including a message from a listener whose ship was re-routed away from the storm. A story about NCL's new TV show, Dream Quest, cruise chit chat, our themed cruise of the week, and Helga too! Thank you so much for supporting and sharing our podcast with your friends and family. We appreciate all the kind words, messages and emails. As I said before, “California is Catalina, California’s own Island Resort. Gorgeous mild weather all year long - it’s always a beach day at Avalon or Two Harbors. One can get there by helicopter, airplane or boat.” This time my adventure was to begin on my birthday. What giveaways and discounts can you get on your birthday? My adventure started three weeks before. For my first savings, Catalina Express has a promotion going on where they will give you a free round trip boat ticket to Catalina. The catch is that you must travel on your birthday. Savings - $74.00. Visit (www.catalinaexpress.com) for more details. After that, one call and I was on my way! Before leaving I went onto www.Catalinachamber.com and click under Specials & Packages then click under Birthday Island! and printed the only sheet of paper one needs to find the great birthday deals to be had. There are about 50 different things to choose from. Areas covered are, Where to Stay?, Where to Shop?, What to Do?, and Where to Dine. After arriving on the island go to the Visitor Center located on the Green Pleasure Pier to grab the Catalina Island Map & Directory. My first stop was to Catalina Coffee & Cookie Co. for my FREE coffee. It was well worth it. Savings - $4.00. Try one of there famous cookies, it was not free but, well worth it. From there it was off to get my Birthday massage. The massage cost $95.00; on my birthday it was $79.00 a Savings - $16.00. Did I say the place is called Massages By The Sea? The massage was done in a private cabana at the Descanso Beach Club. Check out the view in the video. After my massage it was off to get my free ice cream from Descanso Fresh a savings - $5.00. Of course I had to have a cocktail at the Beach Bar while I was there. It was time for a round of miniature at Golf Gardens Mini Golf. I did play by myself, a fun course with a few challenging holes. Cost = Free, Saved - $10.00. Now on to Bowling at Three Palms Avalon Arcade. Yes, it’s bowling on Catalina, well kind of bowling. It’s a giant Skee ball game and it’s Free. Savings - $5.00. Now the food was incredible - my first stop was a place called Buffalo Nickel Restaurant. The only way to get there was a tram that took you there and back. I had my Free Birthday meal: a burrito and chips and wow was it good! The Margaritas weren’t so bad either. Cost at least $10.00. I did not add it all together. From there it was time to hit the beach. I grab my Free Snorkel Gear from Scuba Luv and hit the ocean. After a few hours of swimming I packed it in and went to Mi Casita for another snack and drink. It was not free but well worth it. For my last free item for the day I was off for dessert at Lloyd’s of Avalon for another free scoop of ice cream. It was a great to get away for the day and celebrate my birthday. All in all it was a good birthday with all the fun freebies, discounts and things I did. Parking at the Los Angeles port was $15.00 all day so plan that into your budget. There are other activities and tours you can do. Follow the birthday sheet first then contact the other outfits on the island. I went by myself but the “Welcome To Birthday Island” sheet is geared for two-for-one deals such as parasailing, Segways and more. Or, if you just want to get away from the hassles of everyday life, bring a book, sit on the beach and just enjoy the warm breezes.